Samsung is all set to launch its upcoming flagship smartphones – Galaxy S10, Galaxy S10+ and Galaxy S10E – on February 20 at an event in San Francisco. And Samsung fans across the globe are waiting to get their hands on the much-talked-about tenth-anniversary smartphones. If you are also one of these fans, we have some exciting news for you. Indian e-commerce giant Flipkart has now started teasing the launch of Samsung Galaxy S10 smartphones. The website now has a dedicated page for the upcoming flagship smartphones where it has used the banner of S10 Unpacked invite and along with that, there is a ‘Notify Me’ button on which interested buyers can click to get timely updates about the smartphone’s availability. This means that Samsung fans in India who are waiting for the Galaxy S10 devices will not have to wait for too long after the global launch of the smartphones to buy them. 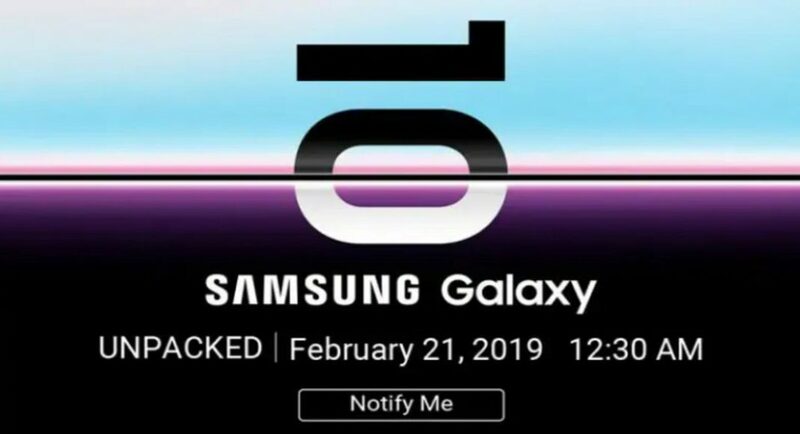 As we mentioned earlier, Samsung Galaxy S10, Galaxy S10+ and Galaxy S10E will be launched globally on February 20 at an event in San Francisco. It is also being speculated that the South Korean technology giant will launch its new Galaxy Buds truly wireless earphones and the Galaxy Watch Active smartwatch at the same event. And as some reports, Samsung Galaxy S10 will be announced in India on March 6 and will go on sale starting March 15. Reports about the pricing of the smartphones have also been circulating online and one such leak gave us an insight into the cost of the flagship devices in India. Samsung Galaxy S10E, which will be the cheapest model among the three, will reportedly be available at a price of Rs 50,000. The vanilla variant of Samsung Galaxy S10 is said to come at a starting price of Rs 65,000, while Samsung Galaxy S10+’s starting price is suggested to be Rs 75,000. The flagship smartphones from Samsung will sport an Infinity-O display to house the selfie camera. While Samsung Galaxy S10E will come with a flat screen, the Galaxy S10 and Galaxy S10+ will feature curved displays. We should mention that Samsung Galaxy S10+’s hole-punch selfie camera will be wider than the one on the other two smartphones, as the handset will come with a dual selfie camera setup. In addition to this, Samsung Galaxy S10 and Galaxy S10+ are reported to sport a triple rear camera setup and an in-display fingerprint scanner. Samsung Galaxy S10E, on the other hand, will have its fingerprint sensor embedded in the power button. The three smartphones will reportedly be powered by either Snapdragon 855 or Exynos 9820 processor, depending on the market, and run Android 9.0 Pie based One UI.